How does an author make the reader feel as though the setting is one of the characters in your book? That answer is different for every author, but for me it means putting myself in that setting and imagining what the character is experiencing. I focus on the five senses: sight, sound, smell, taste, touch. For example, when my heroine in The Search realizes a ghostly grave shows up in a photograph, she revisits the hidden graveyard on the island to take another photograph. I draw out her emotions of feeling foolish for taking a picture of the air, hoping the grave shows up again in a photograph, of hiding her actions from another person to avoid explaining the situation, and of dealing with fear while she’s standing there alone taking the picture. The reader can experience the unnerving snap of a twig that makes the heroine jump. I add in her surroundings, including the tree off to the side where the grave had shown up in the original photograph. I also draw in the history of the old fishing village that had once existed on the island. That small detail, combined with the desert-like heat, the sand dunes, and the horses grazing on sea grass off in the distance, helps create ambiance. Making your setting into a character relies on using several different senses from your point of view character. It also helps if you can tie the setting and the storyline together, so you have a meaningful way to paint a creative picture to keep the reader engaged in your story. Little details tossed in here and there, as opposed to pages of description, will develop vivid imagery painlessly. Choose your words carefully. One descriptive word can take the place of several rambling words. Concise writing provides a streamlined technique to draw your reader into your story and setting. Let them feel the breeze on their face, experience stepping into the muck of a tidal pool, and visualize seeing your heroine fall in a lump from the sliding stop of a horse. The simple word “lump” says it all. It’s easier for me to write about something I’ve experienced, at least in part. If I can draw from a memory and relive it in my head, then the words I write will feel more real to the reader. You don’t have to experience a ghostly grave, however, to write about it. I remember as a child being fascinated with graveyards. I always wanted to see a ghost. A friend of mine and I would roam the cemetery right before closing in the evening. I’d work myself into a frenzy until the snap of a twig caused by an animal set my nerve endings in rapid fire. I drew from that experience when I wrote the scene I described above. The pounding hooves of betrayal have battered photographer Claire Kincaid’s trust in men. After her mother’s death, Claire’s desire for family leads her to the coast to find her long-lost father. Instead, she finds herself stranded on an island with a threatening storm, a suspicious man roaming the dunes, and a dangerous confrontation with a wild stallion. When wildlife biologist and park ranger Jeff Rhoades, who is engaged to Claire’s popular landlady, is sent to rescue Claire, he discovers his attraction to Claire makes him question his commitment to his fiancée. To make matters worse, he secretly searches for her father, against her will. Good intentions go wrong, and he unravels a dubious and hurtful past. An island of secrets is untangled along with the mystery of a horse whisperer who lurks in the horses’ shadows. The more Claire searches for answers, the more she discovers that an old truth never existed. 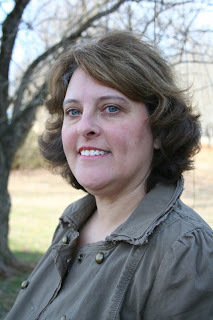 Lori Hayes writes contemporary romance and romantic women's fiction. She promises to deliver a happy ending in exchange for your much-appreciated time reading her novels. She lives with her family in North Carolina, and while she hopes to someday say she lives near the beach, right now she is a short drive from the ocean. She thinks it's important to focus on what you have and to appreciate the small things around you, like the tang of salt in the air. For then it becomes possible for your dreams to come true, like her dream of writing and to be published. She thanks her mother for her career. One day her mom planted the seed for Lori to be a writer, and it took hold. And as her grandfather always said, Stop talking about it and do something. So she did. While her son took afternoon naps, she sat down and started her first novel. Quickly she learned it wasn't so easy. She bought every book she could find on the subject, and to this day she's still buying books to study. She believes life is one lesson made up of many shorter ones. Tell the story of your own life and it will come to fruition. She's living proof. Terrific post. This is so true: "Lump says it all." - and "muck" too. Love the idea of location as your book's scenery, and really love the horses! I read THE SEARCH, and loved it. 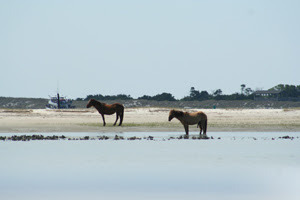 Made me feel I was wandering the sandy shore with the island ponies. Thanks, Nancy. I'm glad you liked it. :) I love that area too.